The number of female entrepreneurs is growing, but the typical Spanish founder is a 35-year-old male. South Summit released its Entrepreneurship Map, showing that women make up 22 percent of Spanish startup founders in 2018, along with an overview of the Spanish startup ecosystem. For the first time, the percentage of women founders of startups in Spain has grown past 20 percent, and now stands at 22 percent compared to 18 percent in 2017. In addition, startups led by women have a lower failure rate than men -- 22 percent vs. 51 percent of projects that have men at the front -- and above all, women are more focused on entrepreneurship in the education sector. "Demonstrating the real value and talent offered by Spanish startups, consolidating the open innovation model and strengthening the position of Spain as a global benchmark with a strategic position as a gateway to Europe and Latin America" will be some of the keys for which the Spanish entrepreneurial ecosystem has to fight for, said Marisol Menéndez, who is responsible for BBVA's Open Innovation and Ecosystem Partner of South Summit 2018. Despite this advancement of women, the portrait of the Spanish entrepreneur is typically a male averaging 35 years of age with previous university studies (93 percent) and a solid career of being a serial entrepreneur with 46 percent of male Spanish entrepreneurs having created more than one startup. 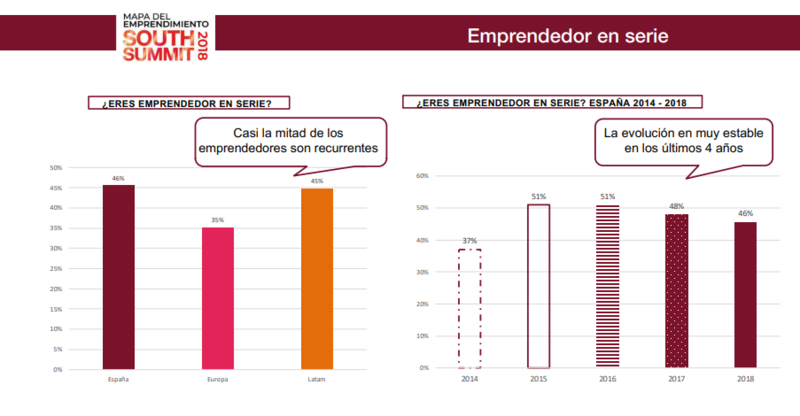 Only one in 10 Spanish entrepreneurs were previously unemployed, and six out of 10 admit that they always wanted to create a startup while 23 percent joined a startup project in which they believed in. Only 18 percent of startups have a single founder while 35 percent have two founders and 29 percent have been created by three entrepreneurs. Related: Boom or Bubble? The 3 Issues That Block Spain's Startup Sector From Sustainable Growth. Spanish startup ecosystem is growing strong. The 2018 Entrepreneurship Map sampled 1,252 startups out of the total of 3,200 projects submitted to the Startup Competition by South Summit Madrid 2018, including 52 percent of international initiatives and 48 percent of registered national projects. Presented today in the City of Madrid, the Entrepreneurship Map 2018 shows that Spanish startups are growing with 66 percent surviving their first year. The average startup age is 2.3 years, surpassing the figure of 2017, which stood at 1.87. Spanish startups have also been consolidating in business issues; 17 percent have a positive Earnings Before Interests, Taxes, Depreciations and Amortizations (EBITDA), compared to 14 percent registered in 2017. And, on the other hand, startups have also increased the number of hiring and have created more solid teams, with an average of seven professionals employed, compared to the six members observed in last year's report. Also, in the short term, 83 percent of projects are looking for new members. The level of development of Spanish projects is gradually growing, according to this report. And although the majority are in the seed (33 percent) or early (39 percent) phases, 20 percent of Spanish startups have already reached the growth phase, with similar levels to the European and Latin American ecosystems. Collaborations are important to Spanish startups with 80 percent of entrepreneurs having among their priority objectives to close business agreements with a corporation. The same percentage seek to generate visibility for their startups while 72 percent seek to achieve investment for the project. For María Benjumea, founder of Spain Startup-South Summit, "this trend shows that the open innovation model is settling in the Spanish ecosystem. Especially because of an increase in demand for rapid innovation in corporations."